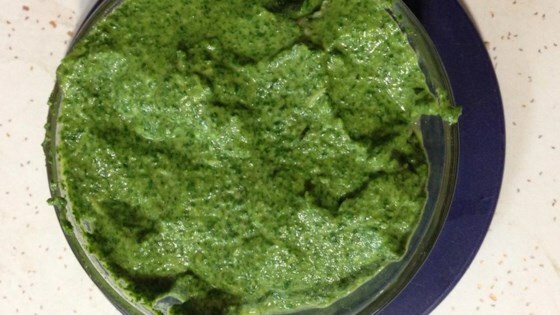 "This tasty pesto is delicious tossed with warm pasta and chicken or spread on garlic bread." Heat 2 teaspoons of the olive oil in a skillet over medium heat; cook and stir the Swiss chard and garlic in the hot oil until the chard leaves have wilted, 3 to 5 minutes. Remove from heat and allow to cool. Process the basil, pecans, sea salt, Parmesan cheese, and remaining olive oil in a food processor until all the ingredients are well integrated. Add the Swiss chard mixture and the lemon juice to the food processor; continue chopping until the mixture is pureed. Season with salt and pepper. This easy Italian side dish is bursting with flavor and nutrients. I think this was a great recipe. We toasted the pecans first though. and instead of sauteeing, we blanched the basil and swiss chard so it would retain a brighter color. Great with walnuts too if you don't have pecans on hand. Not as good as traditional pesto but a good way to use up Swiss Chard from my garden. I was going to give 3 stars but didn't have pecans so used walnuts so wanted to be fair. Nice way to use up extra chard. That was really YUMMY! Thankyou so much for sharing. My kids really liked it too. Hands down this is my kids' favorite thing I make. Great on pasta, pizza, or garlic bread.